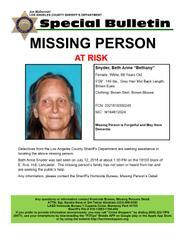 Los Angeles County Sheriff’s Department’s Missing Persons Unit detectives are seeking the public’s assistance in locating Beth Anne “Bethany” Snyder. She is a 68 year-old female White who was last seen on July 12, 2018 at about 1:30 PM on the 18100 block of E. Ave H-6, Lancaster. 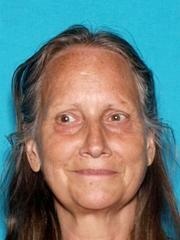 Ms. Snyder is described as 5’09” tall, 145 lbs., grey hair mid back length, brown eyes. She was last seen wearing a brown skirt, and brown blouse. She is forgetful and may have dementia. Her family and friends are very concerned and asking for the public’s assistance in locating her.